Not surprisingly some of them have secured properly zoned dump sites in South-East Queensland, in the Ipswich City Council area. These sites were formerly open-cut coal mines, but are now just holes in the ground. This looks like a win/win to me, and one that has been run many times in Australian history. 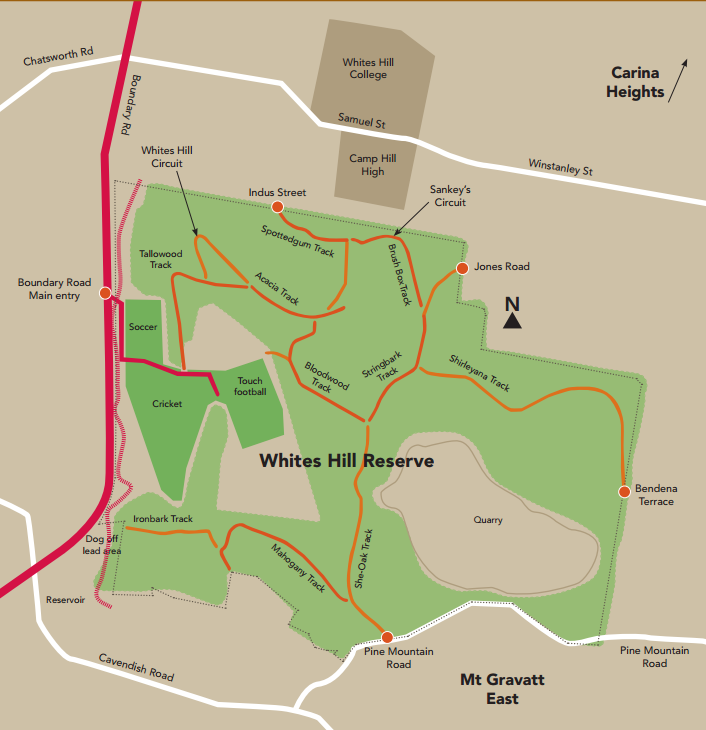 Take Whites Hill Reserve at Holland Park (illustrated at right). Adjacent to some of the most upmarket real estate in Coorparoo, it was originally a quarry, and when I was growing-up, the local dump. Unless we are going back to the stone age, waste disposal is a fact of life. And where better to put it than into a hole in the ground that can eventually be turned into playing fields and a recreational reserve. Local residents put up with the dump for decades, but in the end were rewarded with a first class set of playing fields, and an outdoor auditorium. Take a close look at your local playing field and the chances are it was originally filled with waste material before being finished-off as a recreational facility. However, in the hands of reporter Caro Meldrum-Hanna, fueled it would appear by industry lobbyist Grant Musgrove (who makes some outlandish allegations about criminality in the waste disposal industry), what is a sensible commercial arrangement, is demonised. This is stoked by some local NIMBYs who don’t appreciate the jobs the industry brings into the area, and can’t wait for the benefits that will accrue from the open-cut mines being filled. Local politicians, including Cr Paul Tully, candidate for Ipswich Mayor, have jumped onto the issue, although, as the facilities were all approved by the council, and Tully is currently the deputy mayor, you’d have to think he was partly responsible. He is trying to dump (sic) the responsibility onto the state government, and so the Premier Annastacia Palaszczuk, having waxed lyrical about the evils of trading with New Zealand is now inveighing against the importation of solid waste fill from New South Wales. Where is the politician who will stand up for the residents who earn money from the facilities, or from those who work in the facilities? I remember back in 1991 that Ipswich was keen to take Brisbane’s rubbish. It would have cost $30m more than building the Rochedale dump. 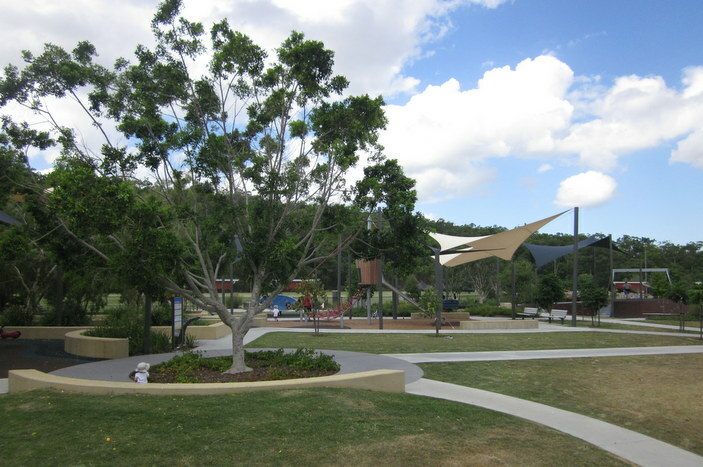 Lord Mayor Sallyanne Atkinson went ahead and built the Rochedale dump, and the cost to her was the Lord Mayoralty, which she lost to Jim Soorley on this very issue. To further illustrate the possible benefits of filling-up old mines with waste, here are some more pictures from Whites Hill Reserve. Some of the dumpsites are former mines, slowly burning. And if there is a less appropriate site for oft times, highly toxic waste disposal? It escapes me. Gone are the days of turning waste dumps that may be riddled with asbestos and all manner of harm causing toxic substances, [which like most polystyrenes, give off cyanide gas when burned,] into places where children safely play! And that single cyanide gas example of what some of these old asbestos/arsenic riddled dump sites may contain as long term contaminates. Even so, if sealed with impervious clay to keep rainwater out! Able to be used sometimes as reasonably safe BMX/motocross tracks? Before forced amalgamation, we used to recycle everything! Now it is all just landfill! Even E waste, which has a considerable profit upside! It makes no sense to dump recyclable glass in landfill, then ship silica sand to Korea and import it back as glass! Made with gas we export to them! With a carbon loaded transport component both ways! Manifestly mad hatter’s tea party stuff!? Recycling has been rendered largely impossible by the local cost of energy and water! And that’s completely and absolutely down to government policy/inaction and protecting foreign price gouging, tax avoiding foreign investors from sovereign risk? Waste tyres can be turned into mega barrels of crude oil by the use of large scale industrial microwaves. All that prevents total recycling of all waste tyres, is the obscene cost of massively price gouged energy! Ditto glass recycling. Ditto plastic, which can be recycled 5 times before it exhausts as recyclable material, but can even then be baled and used in place of coal in energy dependant single step, arc furnace, steel smelting. Recycling highly profitable E waste as simple as crushing it to a fine powder, then applying mine site, gravity, magnetic concentration and flotation recovery to it! Followed by refinery processing to very very profitably separate the precious metals! At far greater concentration in untreated E waste, than any mine sourced ore! The cost of both reliable water and energy central to profitably recycling most recyclable material! We have just transitioned through the warmest july on record, even as the northern hemisphere is alive with reports of record heatwaves, related fatalities and wildfires all over the place! And during a waning phase of the sun, at the bottom of a cyclical activity cycle? See NASA and photos of the surface of our star which has the typical fried egg look which marks the bottom of a cyclical activity cycle! I’ve written on the topic of low cost carbon free energy until I’m blue in the face. Only to be completely underwhelmed by massive indifference or buried head ratbag rhetoric! I wonder how comfortable the decision makers would be if we shipped cyanide laced mine waste to Vaucluse or Toorak and used it as street and pavement fill! Then shrugged, what’s the problem? As cancer clusters became the predictable result? Time to get both real and serious, Politicians, Publishers, prophets and Professors, one and all! Stop with the obfuscation, pious hand wringing inaction/misinformation and just get on looking after Aussies and their interests first and foremost! Or stand on your deplorable risible records come election time! Not sure where you get all this garbage from Alan, but why do you have to always dump it on my blog at the top of the comments? It is very frustrating. I’m not sure why you’re not sure Graham? I found no fault in the highly ethical reporting of Four Corners. And I waited till after 9pm to comment on your mischievous, vexatious, 1.22 pm blog! If you think I make stuff up? Feel free to purchase a couple of polystyrene boxes, then set fire to them to boil the billy, while you sit just downwind breathing deeply/keeping warm? About ten minutes ought to suffice? On second thoughts don’t bother as that may kill what brain cells you’re still using, now and then? Can’t have people suspecting we might actually be friends can we? Back on topic, I meant to add how we might overcome the gas crisis, with never ever ending gas production utilizing Aussie innovation. And a locally invented two tank system that could be retrofitted in many domiciles, high rises and industrial estates, where our own biological waste is fed into smell free, closed cycle digestors, to create biogas, which is mostly methane, along with endless free hot water and doable. Adding in food scraps creates a saleable surplus. As does scrubbing the gas then using it in another Aussie innovation, ceramic fuel cells, where the combination produces an 80% energy coefficient! Four times better than coal fired power. And given lighter than air methane is, at the atomic level, mostly hydrogen atoms, and given the conversion is a chemical reaction, not combustion per se. Produces mostly pristine water vapor as the exhaust product. Done on a large enough scale using social credit as government sponsored loans? Almost as if we were a bankrupt war torn Japan undergoing its own post war economic miracle!? And minus any western financial assistance!? Just this one idea could completely rebuild our down in the doldrums steel industry. But particularly if cooperative capitalism/social credit, was prioritised as the regeneration mechanism. Every Australian family, produces enough digestible biological waste to individually power their homes very reliably 24/7! Given methane using ceramic fuel cells are included, able to produce around a never ever ending, 50% saleable surplus. Multiply that by around 1-6 million homes!? Moreover, given most of the costs are upfront, virtually for free! Furthermore, the byproducts include, sanitized carbon rich soil improver and reusable nutrient loaded sanitised water. Very suitable as underground taped irrigation for a variety of cash crops. From cotton/citrus/corn/grapes/fruit/industrial hemp/tomatoes/fibre/bamboo/pumpkins/strawberries/blueberries/cherries/oil rich algae to coffee. And vastly superior to sending millions of annual litres out to sea, where it does nothing but quite massive environmental harm! Most of the methane flares you see coming out of gas wells and refineries etc, can instead, be passed through a relatively simple catalytic converter to turn it into liquid methanol or even diesel replacing liquid hydrocarbons or all manner of plastic manufacture. Recycling E waste and or tyres, almost tailor made for some cash strapped indigenous communities? As is the sanitary conversion of biological waste into endless free hot water and equally endless, virtually free energy! Along with massively enhanced agricultural opportunities! Let’s give these folks back their self esteem along with a measure of self determination as a hand up! As opposed to endless handouts and sit down money!